Too constructed. That’s what this book is. It took me a while to figure it out, but everything made sense once I read the acknowledgement section: I would like to thank…one long list. No heart, no emotion, no genuine feeling. Deeper, nearly allegorical meaning? Yes (ants). This is interesting. Maybe I’m spoiled for having just read Annie Weatherwax’s ALL WE HAD. On one side, you have a seasoned writer, who teaches writing, putting together all the elements of a perfect novel. On the other side, you have an artist. This artist does it all, but has made a career out of making superhero and kids’ comic models. Difference: emotion, depth, and sight. I want to FEEL something when I read fiction. 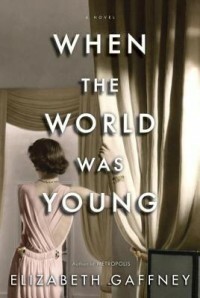 WHEN THE WORLD WAS YOUNG should have made me feel something from any of these: a love affair, racial tension, nuclear development, women in college. But nothing. It was all cut and dry and calculated. Thank you to Random House for providing this book electronically for me to review. I love this time period (thumbs up to another recent ICE CREAM QUEEN OF ORCHARD STREET for the same era), but I like to believe there was something more waiting to be felt.